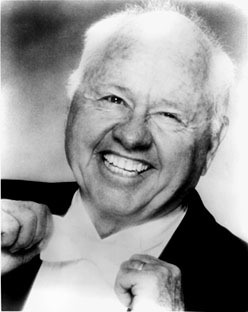 Mickey Rooney's father, Joe Yule, was a vaudeville comic and actor, and Joe Jr. was part of his parents' stage act starting at about 18 months of age. The act ended, along with his parents' marriage, after Junior walked in on his father with another woman. He made his motion picture debut at the age of five, playing an adult midget in the 1926 silent short Not to Be Trusted. Beginning at age 6, he starred in dozens of silent-era comedy shorts, playing (and billed as) "Mickey McGuire". At 12 he became "Mickey Rooney", when his agent decided he needed a new name to land any roles beyond the McGuire shorts. "He never bothered to ask me whether I liked it", Rooney wrote in his autobiography. "This is the kind of world I was born in, one in which I had only one reason for existence: pleasing others". As an adolescent, Rooney co-starred with Judy Garland in a series of squeaky-clean MGM musicals, often revolving around the urgent need to put on a show in somebody's barn. Rooney starred in fifteen "Andy Hardy" movies, and made more than 200 other movies and half a dozen TV series. "I was a 14-year-old boy for 30 years", he says. Among Rooney's more famous movies, he played a gangster in Manhattan Melodrama (1934), a goodhearted crewman in Spencer Tracy's Captains Courageous (1937), a juvenile delinquent in Tracy's Boys Town (1939), the cynical jockey and trainer in National Velvet (1944) with 12-year-old Elizabeth Taylor, a caricature of a Japanese landlord in Breakfast at Tiffany's (1961) with Audrey Hepburn, a bitter boxing trainer in Requiem for a Heavyweight (1962) with Anthony Quinn and Jackie Gleason, a panicked man in a pilotless plane in It's a Mad Mad Mad Mad World (1963) opposite Buddy Hackett, and another horse trainer in The Black Stallion (1979) with Teri Garr. Rooney continued making movies well into his 80s, although they were usually low-budget direct-to-video atrocities. He was one of Hollywood's most married men. Barbara Ann Thomason, the fifth of his eight wives and mother of four of his ten children, was murdered in 1966. The following year he married and divorced her good friend, Marge Lane. When he appeared on talk shows in the 1990s and 2000s, Rooney almost invariably reminded audiences that he was the number one box office star of 1939, 1940 and 1941. "I was the number one star in the world, you hear me? The world!" He then regaled the host with tales from his Hollywood history. He also said he came up with the stage name "Marilyn Monroe" for blonde innocent Norma Jean Baker, and lost his virginity in a brothel where the tab was paid by show-biz pal Milton Berle. He claimed to have "discovered" Sammy Davis, Jr., and said he turned down the Archie Bunker role in All in the Family. He said that he became a born-again Christian in the early 1970s, when an angel appeared to him in a diner. And he fondly remembered being called "the best actor America ever produced" by Laurence Olivier. At some point, credulity snaps. In 2005, Rooney filmed a commercial for a cold remedy, in which Rooney's towel slipped off in a sauna, exposing his 84-year-old buttocks for about two seconds. The ad, scheduled to premiere during the Super Bowl, was rejected by network censors. Rooney angrily described the commercial as "a fun spot", and said "the public deserves to see it". He died in 2014. Girl Crazy (26-Nov-1943) · Danny Churchill, Jr.